A solid overall team performance netted St. Helens its first American Legion baseball victory of the season on Monday. Still, the Saints' 8-4 win at Madison left a few things to be desired. Namely, 15 runners left on base, one or more in six of the game's seven innings. Coach Steve Galovich would liked to have seen his visiting team drive home at least some of those stranded runners. Three times, the Saints left the bases loaded. With one or more additional timely hits, St. Helens could have broken the game wide open. But as it turned out, the Saints didn't need to clear the base paths every inning. The runs they got — two in the top of the second inning, three in the fourth, one in the sixth and two in the seventh — were plenty on a day when their pitching and defense kept the Cutters (Madison) from mounting a charge. "It seemed like every time we had guys in scoring position, the bats fell asleep, but our pitching and defense did really well," Galovich said. St. Helens, playing an A Legion schedule this summer, had played only two other games. 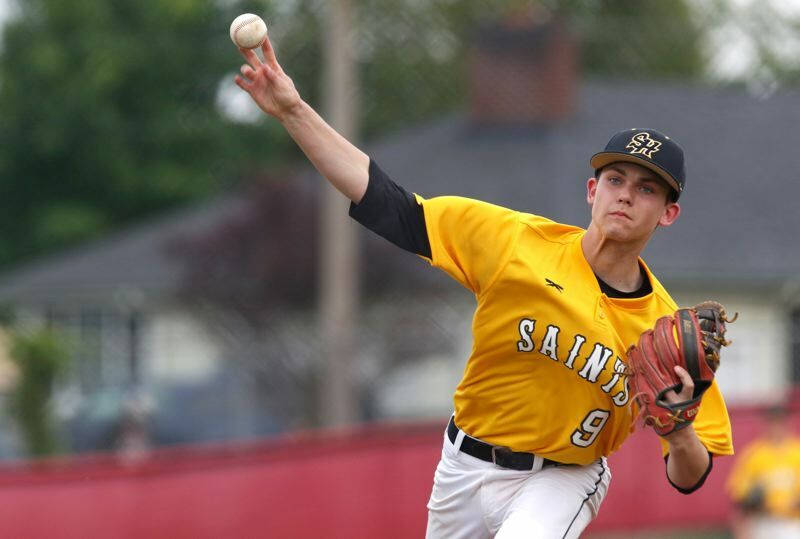 On June 16, the Saints lost at home, 11-1 and 20-10, to formidable West Linn, one of the top Class 6A baseball schools year in and year out. So, leading all the way (and by as much as 8-2) against Madison was a welcome change. "It's always nice to get a win," Galovich said. "Makes the drive home a lot better." St. Helens suited up 12 players on Monday. Galovich said he has had 16 Saints turn out for a 21-game season that, hopefully, will give next year's high school team members some valuable experience. "All these kids, we want to get them in there as much as we can, because they're the ones coming up through the system," Galovich said. Summer ball "isn't super serious. But we get to come out and play," said St. Helens pitcher/infielder Kaleb Edwards, who will be a sophomore next school year. "We get a lot of games in," added catcher Ryan Maher, who also played junior varsity for the high school as a freshman this spring. "Regular season was a little iffy. This gives us a lot more games. That's why summer ball is nice." Madison coach Eric Bennett was the one who suggested to Galovich that St. Helens get into A Legion ball this year. "We weren't in a league last year. We had older kids and played a mix of Futures and OIBA teams," Galovich said. "What we'd like to do is field a Legion team and have a Junior State team for our incoming freshmen. "This year, we've got more younger kids and it's easier for us to schedule games being in a league. It also gives our kids something to play for. Last year, we had a good time, but at times things we're kind of ho-hum, not being part of a league." In the Madison game, St. Helens right-handers Edwards and Levi Vanderwerf combined to do all the team's work on the mound. Edwards pitched the first 5 1/3 innings and Vanderwerf did the rest. Edwards allowed only two hits, while striking out five batters. He gave up two runs, one earned, keeping Madison hitters swinging late with his fastball. That said, he deflected any praise for his outing. "Today wasn't one of my best days. I felt a little off at first," Edwards said. Galovich, however, was very appreciative of the job done by both hurlers. "Both guys pitched well," Galovich said. "They kept the ball down and got a lot of ground balls. You want them to get ground balls so the infielders can field them and that's what we did." The pitchers got a big boost from each of the infielders. Third baseman Justin Olson, shortstop Nick Brooks, second baseman Jared Hora and first baseman Jackson Hald took turns making stops and turning plays. Olson fired some sharp throws across the diamond. Hald showed good range and didn't hesitate to dive for the ball, denying Madison batters. St. Helens made only one error. "That made a big difference on the scoreboard," Galovich said of the defense. Behind the plate, Maher was a key as well, keeping numerous pitches in front of him when Madison had runners aboard. "He did a really nice job," Galovich said. "That's the first time I've seen him catch since he was in Little League." At the plate, Maher went 3 for 4, with a double, two RBIs and two runs scored. Brooks delivered the first big blow. He doubled to center field to score Hunter Vanderwerf and Hora and give St. Helens a 2-0 lead. Madison got one run back in the third inning, when the Senators produced the first of their five hits. The Saints responded with a three-run fourth inning, though, and that put them in control. Edwards helped his cause with an RBI double over the third base bag that plated Jake Maher, who had walked. Ryan Maher's two-run double to left came a few moments later, scoring both Luke Roth, who had walked, and Edwards. St. Helens' sixth-inning run came when Ryan Maher led off with a single and eventually scored on a walk to Trevor McFarland. The Saints capped their scoring in the seventh with Vanderwerf hitting an RBI single to left and Brooks walking with the bases loaded. "A lot of the younger kids really hit the ball hard today. It was good to see," Galovich said. St. Helens also showed some offense in Game 2 against West Linn. Edwards, the team's leadoff batter, got on base all four times, on three walks and an error. In the summer opener against West Linn, Edwards scored St. Helens' only run. He drew a walk and later crossed the plate on a single by Hald. Hald and Levi Vanderwerf then had two hits each in the nightcap versus West Linn. That game was tied 3-3 through two innings when West Linn tallied 12 runs in the top of the third; St. Helens retaliated with seven runs in the bottom of the frame, but couldn't close the gap any further. St. Helens' next game is Friday at Horizon Christian. Then it's on to Ridgefield, Washington, for a game at noon Sunday, followed by a Ridgefield visit to St. Helens at 6 p.m. Wednesday, June 27. Galovich said he figures he has about a dozen players who are capable of taking the hill this summer. "At some point, we're probably going to need all of them," he said, "and I might bring up a couple of eighth-graders as well for pitching."